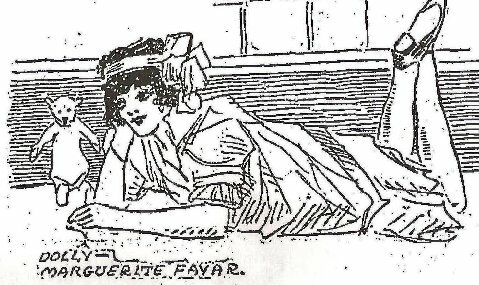 She’s now a forgotten name but in the early 1900’s, Marguerite Favar was widely known as a dancer, and for several years toured vaudeville circuits in the South and West. She was born Adelaide Farvarth in 1887, and came to the United States from Australia with her mother Alice around the turn of the last century. Marguerite first began appearing in music halls until 1905 when she created a sensation in Portland at the Lewis and Clark Exposition as the “Peacock Girl” at the Turkish village. She then toured the United States on several vaudeville circuits, making a name by her charm and daintiness. It’s believed that Marguerite may have been married twice. Her first marriage was reportedly to a man known as Creatore, a famous bandleader of the day. However, after her death, Creatore’s manager declared that Favar was never the bandleader’s wife but that she may have been the wife of a musician who had recently been enjoined from giving performances under that same name. In any event, Marguerite was married in August 1909, at the Episcopal church in Santa Ana to Captain Frank D. Tompkins, a retired army officer. Tompkins had enlisted in the Hospital Corps as a volunteer in the Philippines and was given an officer’s commission for distinguished bravery in action. He retired in 1908 and came to California. He stopped for a while in Oakland with his uncle, formerly a warden of San Quentin, and then came south to Los Angeles where he found a job as chief of the property division for the Los Angeles Aqueduct. The original Bisson Company in 1910. 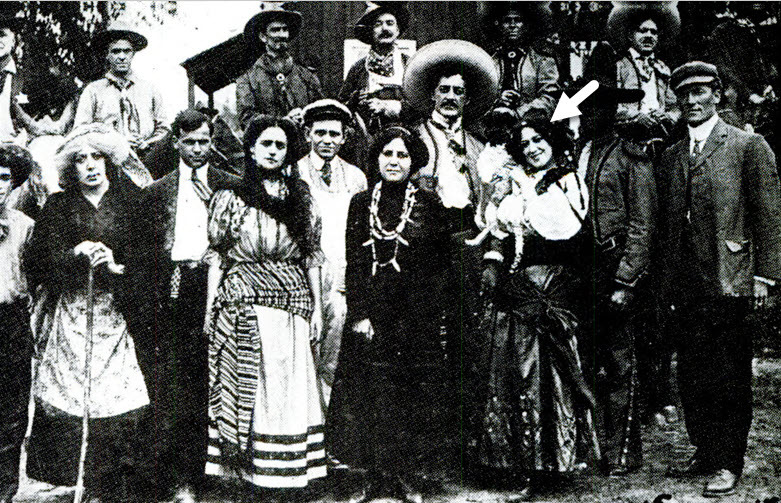 The white arrow points to Marguerite Favar. Soon after their marriage, Marguerite had a try at the new industry in town – motion pictures. It was a brief career with the original Bison company, however there are no records of her film appearances. She worked at one of the studios in Edendale because in early May 1910, she was thrown from a buggy while filming near Elysian Park which is nearby. She was severely injured and had to stay at home for two weeks. On May 19, 1910, Marguerite kissed Frank good-bye and returned to her first day of filming since her accident. She noticed that Frank appeared sick but left the house with no foreboding. He seemed to be suffering from nothing more serious than an attack of the stomach flu. Several hours later, Marguerite’s mother arrived at the house and found Frank in convulsions and called for help. Marguerite was notified at the studio and raced home, but it was too late; Frank was dead at the age of 36. It was later determined that Frank committed suicide by taking poison, however the reason for the act was never known. 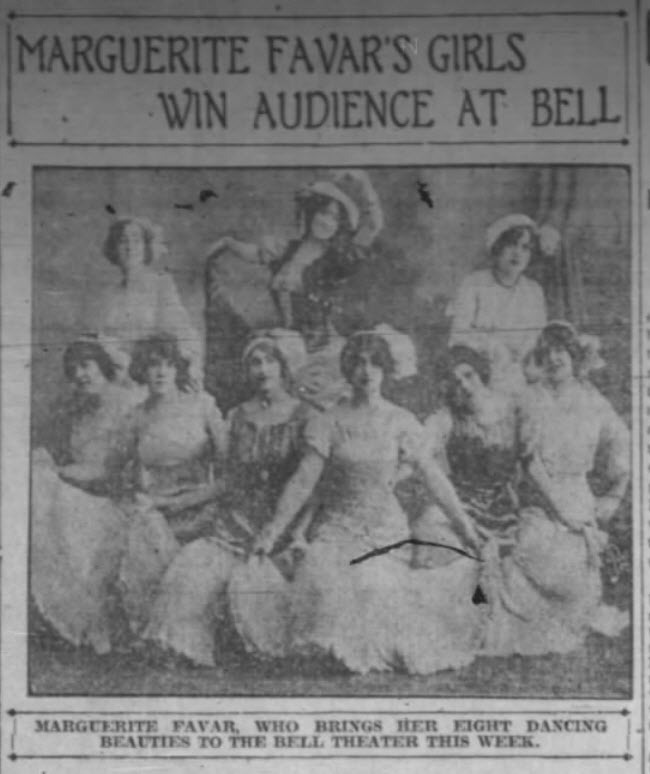 After Frank’s death, Marguerite returned to the stage; at first as a solo act, she was billed as ”Marguerite Favar, That Dainty Dancy Soubrette.” Soon she put together a dance company and called herself, “Miss Marguerite Favar and Her Dainty Dancing Dolls,” and began touring the country. During one performance, a moving picture of the breaking sea at Atlantic City played in the background as the “dainty dolls” pretended to plunge into the surf. Marguerite’s mother died in November 1913, and was laid to rest at Hollywood Cemetery. “Girls are the principal attraction at the Republic Theater this week, for Margaret (sic) Favar and her seven dainty dancing girls are presenting a veritable feminine vaudeville turn de luxe. Magnificent stage settings, elaborate costuming, comely maidens, new songs, novel dancing and catchy music make it one of the biggest and best girl acts seen here for a long time. Miss Favar is clever and pretty, and quick with her feet, and her support is none the less agile.” – (Los Angeles Times, March 24, 1914). Marguerite was a success and enjoyed a lavish lifestyle. Her alluring beauty caused men in every city she visited to become infatuated with her. In letters to a close friend she continually referred to her many suitors that she encountered. Many wealthy men promised her happiness if she would become their bride. In her letters she made light of these proposals. Her friend warned her that this would mean that she would get in trouble one day and that it would be better if she married and settled down. She laughed at his warning. In early 1915, Marguerite and her act was touring the south when they arrived in Greenwood, Mississippi. While there, disagreements arose between the young women, and the act was disbanded. During her stay, Marguerite met James C. Crowell, millionaire manager of the Buckeye Cotton Oil Company, and the two began an affair. Marguerite went to Memphis in August to direct a musical performance for the Elks, a fraternal organization, and stayed on in that city to conduct private dancing lessons. She lived at 889 Popular Street, where she registered under the name of Mrs. F. D. Tompkins, the name of her former husband. Crowell, who had a wife and two children in Greenwood, joined her in Memphis where on September 21, 1915, she gave a dancing exhibition at the Women’s Club Building. After the performance, Crowell met Marguerite backstage and dismissed her chauffeur, Thomas Porter, saying he would drive the car himself. The couple left the theater at 11:55 pm with a friend, Carrie Benham. They went to Marguerite’s apartment and found the rear door to be unlocked. Marguerite, at the time, mentioned this saying that she was certain that she had locked it before she left. Benham left the couple a few minutes later, going to her apartment which was directly below Favar’s. At 4 o’clock that morning, Benham was awakened by sounds of a struggle in Favar’s apartment. She did not investigate. Shortly after sunrise, firemen were summoned by a janitor who discovered smoke issuing from a window in Marguerite’s room. After putting out the blaze, firemen found Marguerite’s body on her bed, her skull crushed by two blows from a blunt instrument and her feet charred by the fire which had enveloped the bed. Crowell’s body was found in a hallway outside her room. His head had been struck eighteen times and his throat was cut. Bloody fingerprints were found and saved by the police. The hammer with which the death blows had been struck was found. The room was in disorder, and the drawers to a dresser was ransacked, which the police believed confirmed a theory that burglars committed the crime. This, however, was partially discredited when jewelry valued at several thousand dollars was found. Other residents of the apartment building reported that they heard a slight disturbance shortly before daylight, but the commotion ceased within a few minutes, and they knew nothing of the murders until they were aroused by the janitor when he discovered the fire. The next day, Guy Palmer, the janitor who discovered the fire and Thomas Porter, Marguerite’s chauffeur, were arrested for the murders. According to police, it was Palmer’s duty to go into the building about 5 am each morning and light a hot water heater, but on the morning of the murder, he claimed to have overslept. With very little else to go on, no formal charges were lodged against them and they were eventually released. Over the next two months, four other men were questioned about the murders but were released for lack of evidence. When news of Marguerite’s murder reached Los Angeles, friends hired detectives to find the slayer, but the evidence they provided was not considered sufficient to warrant the arrest of a suspect. They were convinced they knew who the guilty man was but could not supply enough evidence to place before a jury with a reasonable hope of obtaining a conviction. It was their belief that Marguerite, who aroused many storms of jealousy during her stage career, was, along with Crowell, the victim of a slighted lover who followed them from Greenwood to Memphis. Memphis police were baffled by the murders. They began working on what they termed the “love trail,” which they hoped would lead them to the jealous mad lover who committed the murders. The primary motive for the crime, they stated, was not robbery. Crowell’s body was released and returned to Greenwood the day after the murder. Marguerite’s body had to remain in Memphis until all legal matters were settled. As the actress apparently left no will and had no living relatives, friends planned to have the body buried next to her mother at Hollywood Cemetery. It took time to arrange for this, as legal matters connected to her estate had to be settled. Finally, after lying in the Memphis morgue for six months, the body of Marguerite Favar was returned to Los Angeles for burial. The service was held at 2 pm on March 23, 1916, at the cemetery where friends gathered in the open air beside the Favar plot. Rev. Dr. James A. Francis of the First Baptist Church officiated. Earle C. Houck, who sang at Marguerite’s mother’s funeral, sang a similar tribute at her funeral. Marguerite Favar’s killer was never found.